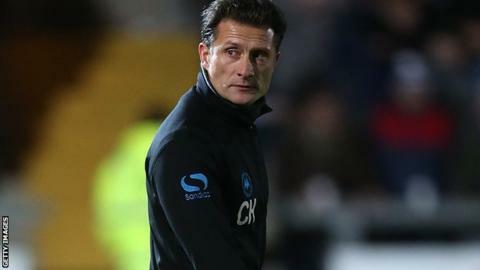 Torquay manager Chris Hargreaves says his side "live to fight another day" in the Football League after Saturday's vital 2-1 victory at Bristol Rovers. The result leaves Torquay seven points from safety with four matches to play. Hargreaves told BBC South, South West and West Late Kick Off: "It's still a mountain [to climb] but I'm pleased that we didn't lay down and die today. "It was a massive win and a really good performance, amid quite a lot of pressure. I'm delighted for the lads." Torquay went into Saturday's game knowing that a defeat plus other results going against them would see them relegated. "I don't think you can look at the table and worry, because it will just give you a heart attack," Hargreaves continued. "We're used to being in this situation. I walked into the club in this situation, and we're still in this situation. "We live to fight another day. The fans were magnificent. I thank them so much. "All we can do is try and win again next week. "We will fight to the last minute of every game."